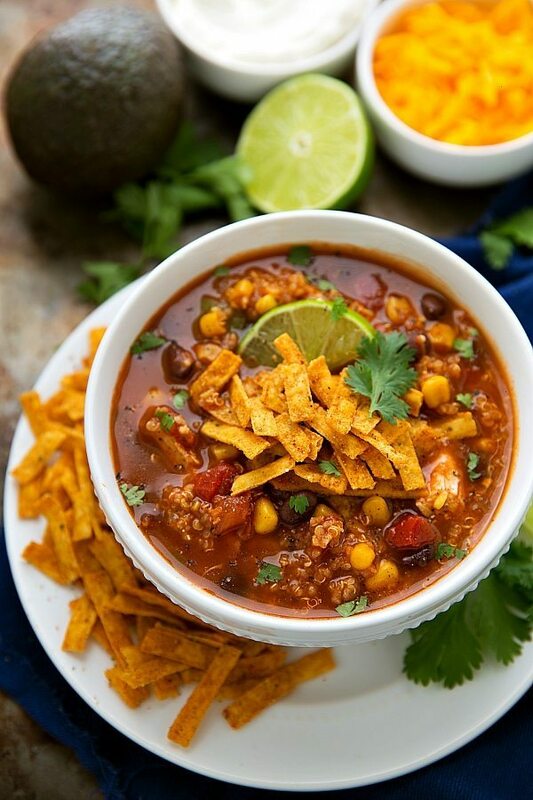 A delicious slow cooker Mexican tortilla chicken and quinoa soup with delicious add-ins such as fresh lime, avocado, tortilla chips, and sour cream. A few weeks ago I was able to go watch my little niece at her pre-school recital. All the adorable little kids sang some cute little songs with creative hand motions that went along with the songs. Afterwards there was a short story and then the preschool teachers read the kids’ cards they had written for Thanksgiving. The cards were fill in the blanks: I’m thankful for my friends because BLANK. I’m thankful for my family because BLANK. I’m thankful for BLANK because BLANK. Let me just tell you, these letters cracked me up. They were some of the funniest things I’d heard in a long time, and my niece’s responses were some of my favorite. She was thankful for her friends because they smile at her, thankful for her family because they sleep, and thankful for lettuce and yogurt because they make her big and strong. Oh my gosh… talk about hilarious. I just can’t wait ‘til little Grey is old enough to say crazy funny things like that! Anyways not that this story really has anything to do with this soup, but in a lame attempt to try and tie it in — my last response to those same questions would be I’m grateful for my slow cooker because it is my favorite kitchen appliance ever. Seriously, I think it is used just about daily at my house. If not daily, definitely every other day! And the results from the slow cooker soup… what a meal! Especially this soup – it’s one of the yummiest comfort meals ever. Also I decided to try this recipe on both high and low settings because I get so many questions about cooking quinoa soups at a different temperature. And great news – this soup can be cooked at low. It does tend to turn more into a stew than a soup, but so delicious nonetheless. There is also always the option to add more broth if desired. On high, this soup remains pretty soupy. All the great flavors come through making this a super convenient dinner. Win, win, win. Also you can pretty much change up the toppings however you like. For me, this isn’t a chicken tortilla soup without loads of cheese and sour cream (both of which I used reduced fat), but you can nix them if desired. The avocado is such a great topping for this soup, especially when paired with the lime and cilantro. I’m a total sucker for lime + avocado combinations. And since the babe is totally obsessed with avocado his soup seemed more appropriately named avocado quinoa soup. The last special ingredient to this soup is Mexican Tortilla Flavor-Infused Broth. Man that is good stuff! Especially when it soaks into all of the other ingredients and cooks on low all day – everything becomes extremely flavorful and there’s even a little bit of a kick to it. Plus minimal spices are needed thanks to the broth. I call for an entire carton of it, but maybe buy two if you like an extra brothy soup. I like mine more chunky and stew-like so one was fantastic for this meal! P.S. My husband declared he absolutely loves quinoa after eating this meal. My life is now considered a success! Drain and rise the black beans. Combine all of the ingredients besides the optional toppings in a large slow cooker. Do not drain the diced tomatoes. Give everything a good stir, cover and cook on high for 3-4 hours or low for 6-8 hours. Note that if you cook this on low it turns into more of a stew and on high it is more soup-like. Shred the chicken and scoop into bowls. Top with freshly shredded cheese, chopped cilantro, lime juice, tortilla chips, and sour cream as desired. The longer quinoa cooks in the slow cooker, the more stew-like it becomes. If you like a thicker and chunkier stew, that's great, if not add in some more broth and if needed additional seasonings. 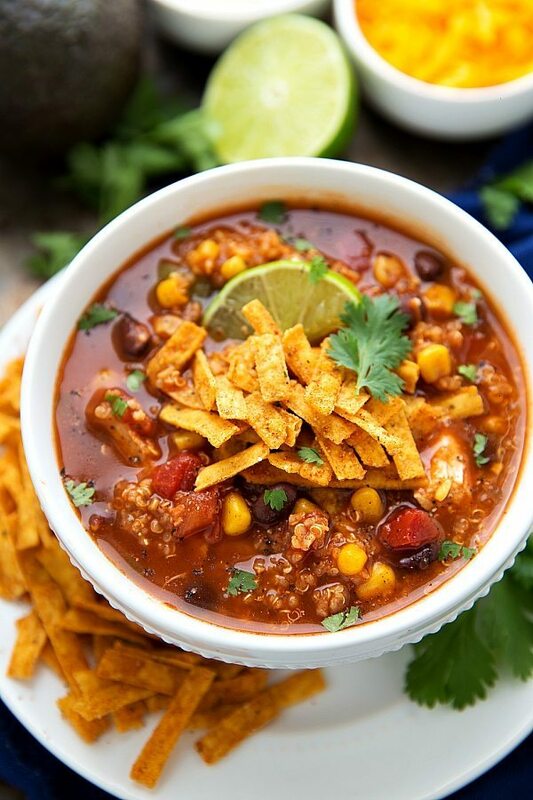 *There have been a few times I haven’t been able to find the Mexican Tortilla Flavor Infused Broth and without that the flavor is certainly lacking. In case you can’t find it or would like to use an alternative, I’ve created another recipe similar to the first but without that specific broth right below this recipe! Top with freshly shredded cheese, chopped cilantro, lime juice, tortilla chips, and sour cream as desired. If needed, increase any of the seasonings and if desired add in some tabasco sauce and ground chipotle pepper. If you like a spicy soup, feel free to increase the jalapeno amount, use a medium or hot enchilada sauce, and get mild or medium diced tomatoes with green chilies. If you'd like less spice, use a mild enchilada sauce, mild diced tomatoes with green chilies, and reduce or completely eliminate the jalapeno. Sounds like your niece’s pre-school recital was adorable, Chelsea! I absolutely love watching little kids perform! This slow cooker soup looks amazing! I love all of your dishes like this, so tasty and creative. And the quinoa and mexican flavors sound incredible! Perfect on a cold day. Pinned! GAH. Thankful for lettuce to make her big and strong. I die. That is TOO cute! And Mexican Tortilla flavoured broth is a thing? A thing that I NEED! This soup sounds great girl – pinned! Sounds like you had fun at your niece’s pre-school recital, Chelsea! I love watching cute kids recital! Ahaha, lettuce and yogurt! Oh I can’t get over it! I love kid stories like this, they really make me smile. Meanwhile, uh, yes please to this tortilla soup? Mhmmm how good does this look?! I can’t believe I’ve never tried any of your crockpot recipes before. Each time I see a new one I think “OMG!”. So many delicious recipes to choose from! I’m glad you were able to convert the hubs 😉 . WIN! Yay more slow cooker recipes! As it get colder, all I want to do is stay inside and slurp soup all day long, so this recipe fits right in with that. 😉 Love this soup Chelsea! Your soups are always amazing Chelsea. Mmm…pinned. Need to get this one on the menu for sure. This soup looks so delicious and comforting! The flavors sound amazing in here and I love that it’s made in the slow cooker! A big bowl of this soup is perfect to stay warm in the chilly weather! These flavors are fantastic! Kids can say some pretty funny things! This sounds phenomenal Chelsea ! 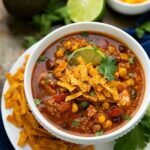 I’m such a fan of Mexican flavors… and the slow cooker makes life so easy when it comes to dinner. Pinning and making! haha kids are so so funny! My little cousin says the cutest (read: hysterical) things all the time. I love it! And I also love this soup! Looks awesome! I’ve been looking for a great slow cooker soup, so this post came at just the right time. The soup looks delicious. Aww, little kids are the cutest!! My old next door neighbors were 4 and 7 years old, so they would’ve said just about the same thing. But they were always thankful for me too because I brought them so many cookies! I bet their mom would’ve been happier had I brought over something healthier, like your soup… 😉 Pinned! This is the 3rd soup of yours I’ve made (sweet potato and quinoa, chicken parmesan, and now this one! ), and 3 for 3 have been amazing. 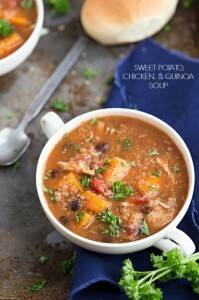 I love that I can now look to your blog to find a reliably delicious and easy-to-make crockpot soup!! I’m not a big fan of creamy/cream-based soups and that’s the majority of what I seem to find on food blogs, so thank you SO much for making broth-based soups/stews because those are my favorites. I also love the flavors you tend to use (e.g., italian, mexican) because are my favorites too! Keep it up, Chelsea! The soup sounds delicious. Unfortunately, here in Germany you can’t buy Tortilla Flavoured broth, only standard beef, chicken or vegetable… Do you have any suggestions what I could use instead? You can buy spice mixes over here. Made this and LOVE it! Even my picky dad enjoyed it! When I try to print your recipes the picture isn’t there. Why is that? I want the picture too!! Oh no! I’m not sure why the picture isn’t showing up for you 🙁 Sorry Willa! I’ve asked a developer friend and I’ll let you know what I hear back! goodNESS! 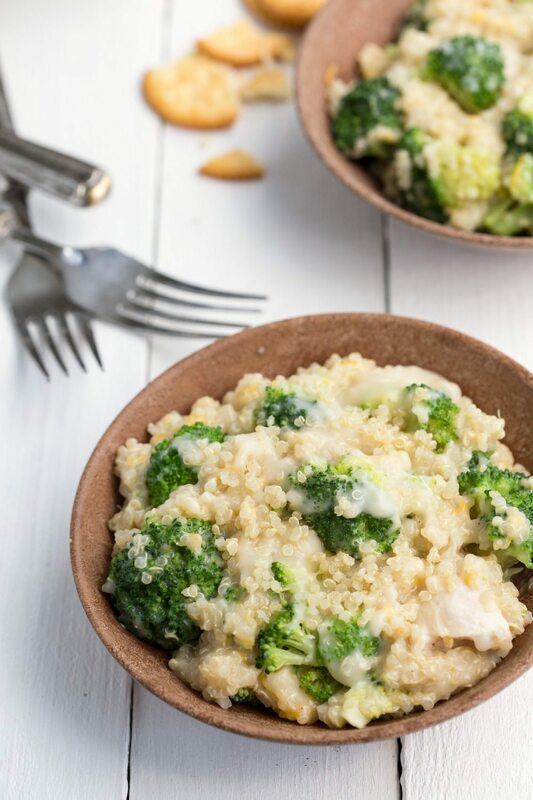 This is delish and so simple, my whole family loved this (including 3 and 5 year old boys!) I just threw the jalapeño in whole and removed it once it was finished cooking to avoid any spice bites for the kiddos. Thanks for a new favorite! YAY!! So great to hear!! I always get excited when the kiddos love it too 🙂 Thanks for the sweet comment and review Ashley! Are you supposed to cook the quinoa before you add it to the soup? Hi just came upon your website and I am hooked! Your double chocolate banana muffins were a huge hit with my 3 boys (husband and 6 & 8 year old!) They are not easy to please! Do you ever include nutritional information? Loving your website. I’m preheating my oven to make your zucchini bread now! Thanks so much! 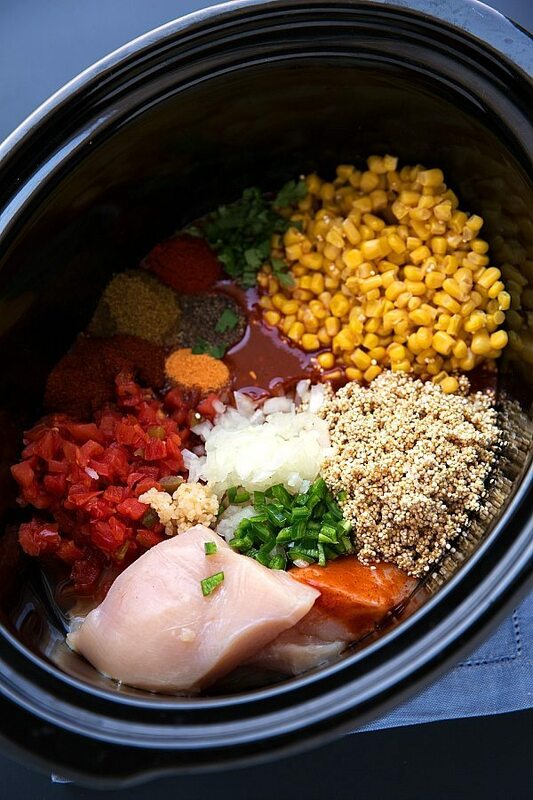 Do you drain & rinse the beans & corn before adding to the crock pot? Just wondering if it would work with ground turkey in place of the chicken? Thoughts?